Weddings are the most beautiful celebrations of life and love. 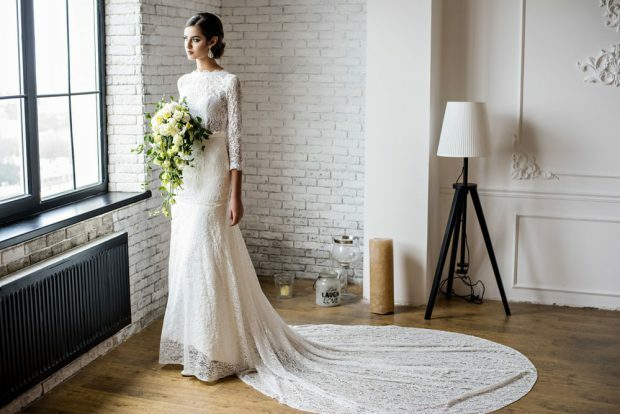 Brides, bridesmaids and guests always want to look their best at a wedding as these special memories will be photographed and last a lifetime. A lot of times looking your best for a special event isn’t necessarily about losing weight, it can be just a matter of debloating. I’ve been asked many times “how can I get a flat tummy for the wedding”, so I’ve created a list of tips and recipes that will help you debloat so that you look and feel fabulous at the next wedding event. Fennel – a natural diuretic food that can help get rid of intestinal gas. Try adding fennel seeds to a cup of hot water or simply chop up fresh fennel and add into your favorite salad. Cucumber – Cucumbers are mostly water based! They contain sulfur and silicon, which can act as a natural diuretic and make you pee. Asparagus – a natural prebiotic that helps support the growth of good for you probiotics. Asparagus is also a natural diuretic, which helps flush out toxins from the body and relieves bloat. Bananas – one of the fruits with highest potassium level. Part of what causes you to retain water is when you’ve eaten foods that are high in sodium. Potassium rich foods can actually flush out the retained water from the body. Kiwi – this low calorie fruit is an excellent source of fiber and potassium, which will help with de-bloating. Pineapple – this tropical fruit is high in the enzyme bromelian, which breaks down proteins and eases digestion. Yogurt – the probiotics in the yogurt are good bacteria that support healthy digestion and reduce inflammation. Go for grass-fed Greek yogurt to bump up the protein to 20 grams and lower the carbs. Ginger Tea – ginger is well known for its anti-inflammatory properties. 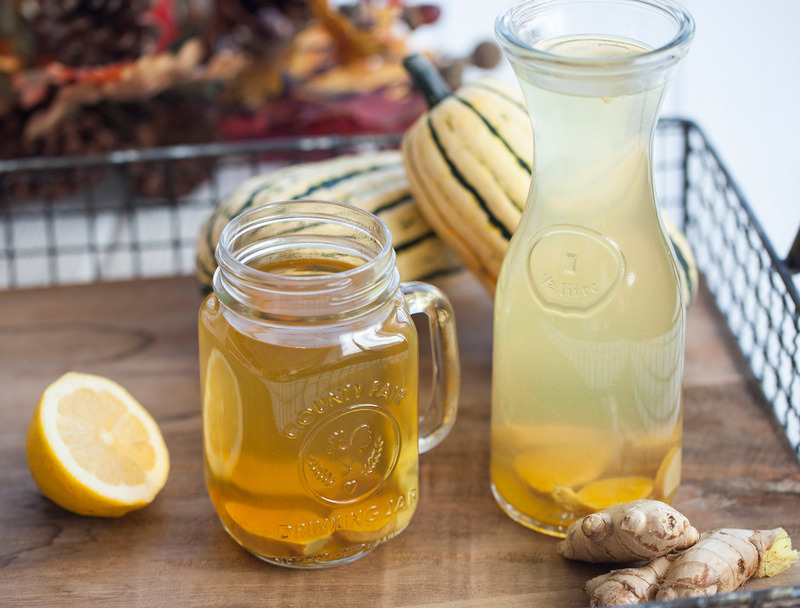 Ginger tea can have a soothing effect on the GI tract, which can reduce bloat and gas. Detox Water – water with lemon, cucumber, mint and ginger. Dairy (except yogurt) – many dairy products cause inflammation which can lead to a bloated belly. Foods High in Sodium – processed and packaged foods tend to be high in sodium, which can cause water retention and lead to a bloated belly. 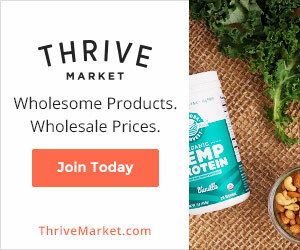 Beans – such as chickpeas and kidney beans that contain oligosaccharides, which cannot be digested by many can result in causing gas and bloating. Artificial Sweeteners – splenda or equal may be zero calories, but they cannot be digested by the body. They ferment in the gut, which can lead to cramping, gas and bloat. Chewing Gum – it can lead to swallowing air, which can cause bloating. Carbonated Drinks – the gas in these drinks can get trapped in your belly which will result in bloating. This ACV tonic is the my favorite way to start the day, especially when I have an upcoming wedding. This concoction infuses your gut with microbes that will promote great digestion through the day. It also contains ginger, which helps to soothe the digestive tract and relieve gas. 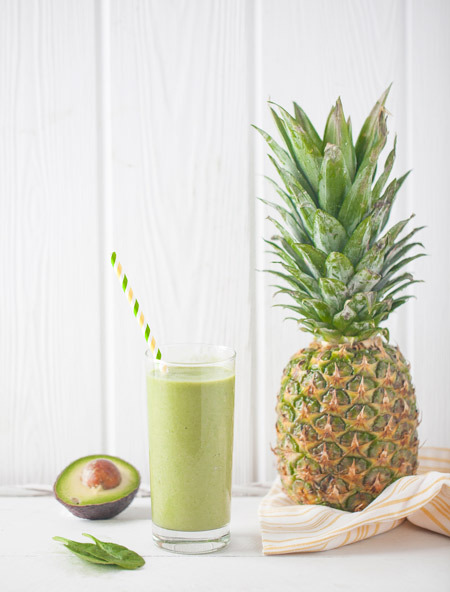 This delicious Pineapple Avocado Smoothie will have you dreaming of a destination wedding. Full of healthy avocados that are loaded with potassium, which will keep bloating at bay. 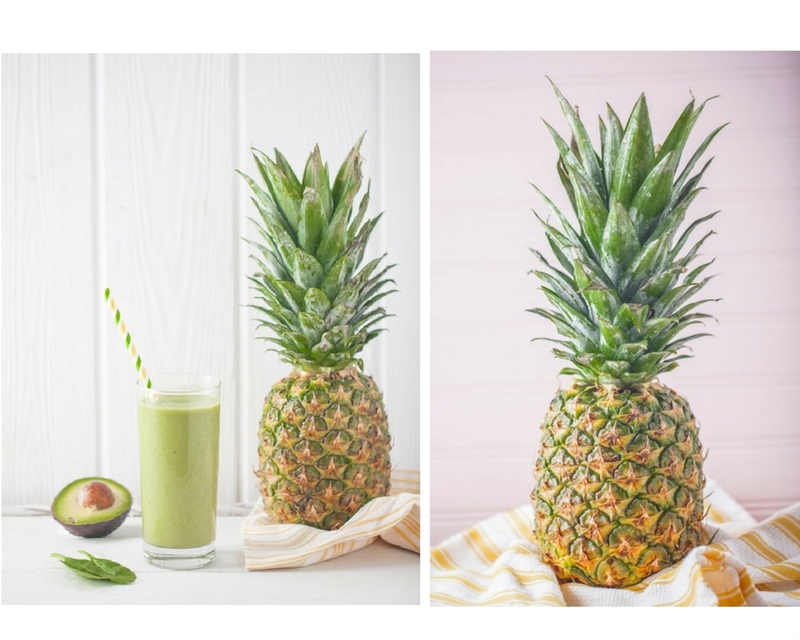 The omega-3’s in this smoothie will make your skin glow and the soluble fiber will keep you feeling full for a long time. Pineapples are potassium-rich and also hold an enzyme called bromelain, which breaks down proteins and encourages healthy digestion. 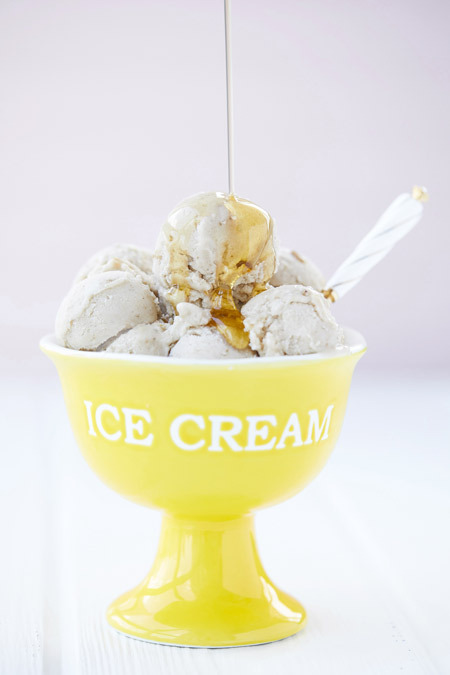 1-2 scoops of this dairy free nice cream will do wonders for your belly while curbing those sugary dessert cravings. In general, a banana can be great for de-bloating because it will help keep your digestive tract moving and it is high in potassium. 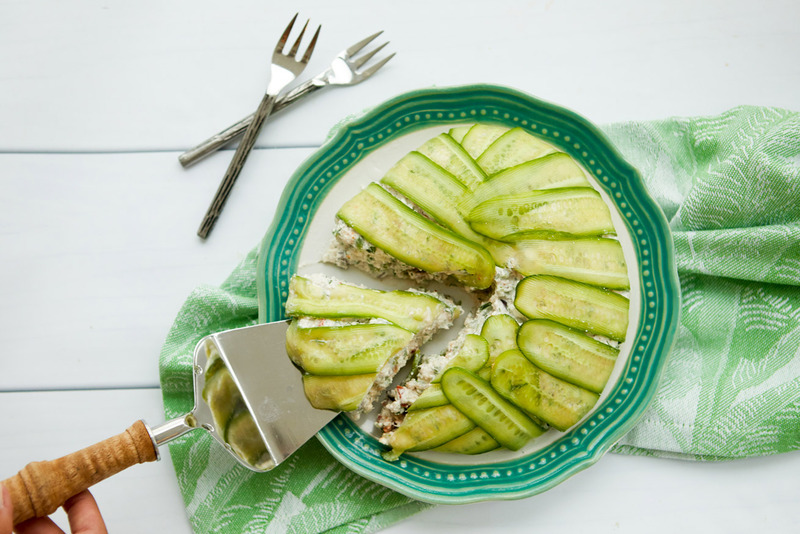 A cake that is actually good for you – my Cucumber Cake is packed with Greek yogurt, which is the only dairy product that does more good than harm. According to Yogurt in Nutrition, ‘This creamy treat packs about 20 grams of protein per cup, filling your stomach quickly without excess volume or calories and contains probiotics that reduce stomach gas and bloating.’ Additionally, cucumbers are diuretic, which helps rid the body of sodium so you won’t be bloated. 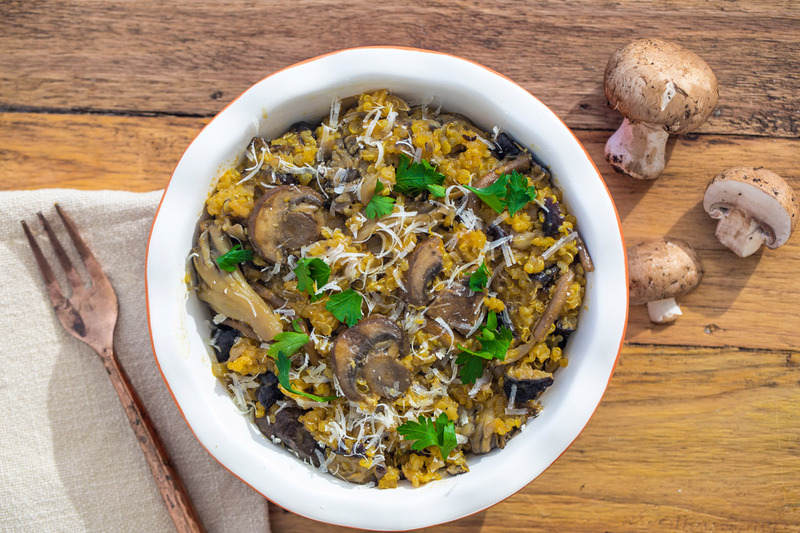 Carb-Free Mushroom Risotto – this recipe will make you feel like you are indulging at an Italian restaurant, but without having to worry about feeling bloated from all the carbs because the “risotto” is very low in carbs! The mushrooms are rich in potassium, which prevents water retention and can reduce salt-induced bloating. 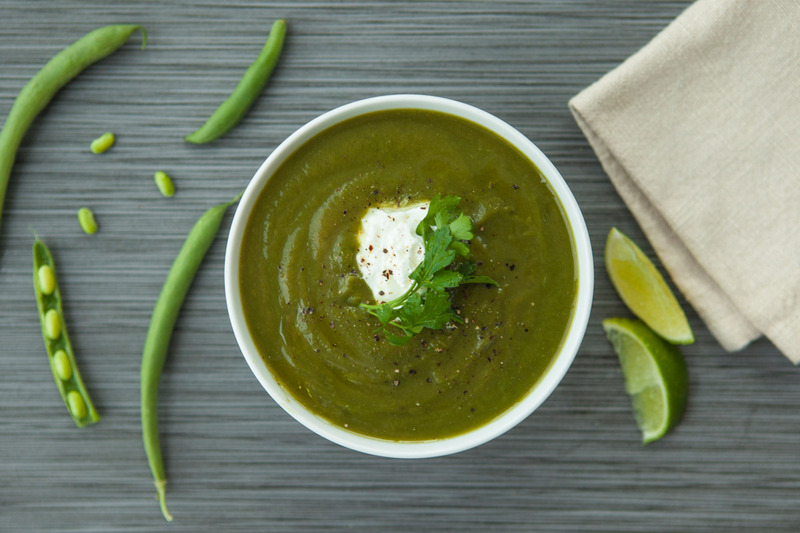 Super Immune Boosting Soup – this soup has a high fiber content, which will fill you up without filling you out. Fiber promotes healthy bowel movements and thus flushes toxins out of the body. 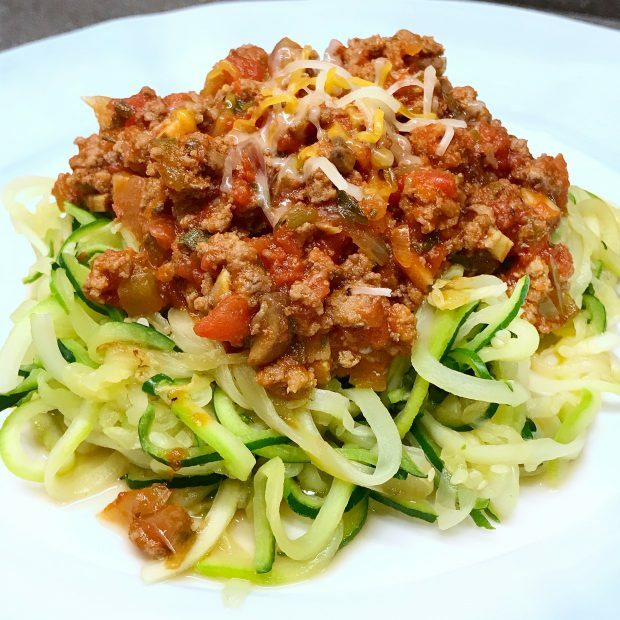 Hearty Bolognese with Zucchini Noodles – Zucchinis are high in water content which acts as a diuretic. This dish is high in protein and will keep you full for hours – it’s absolutely perfect for when you’re trying to de-bloat. How soon before the wedding do you recommend incorporating these foods and stopping the others temporarily? Thank you! Love your tips so much! Whoaaaa!!! Thank you for sharing this with us! This absolutely makes me feel less anxious on how to debloat!